Well, another Eurovision has come and gone. Portugal’s Salvador Sobral won everyone over with his passionate love song, “Amar Pelos Dios”. But of course, no one watches it for the songs, right? You all want to see wacky staging and crazy costumes! 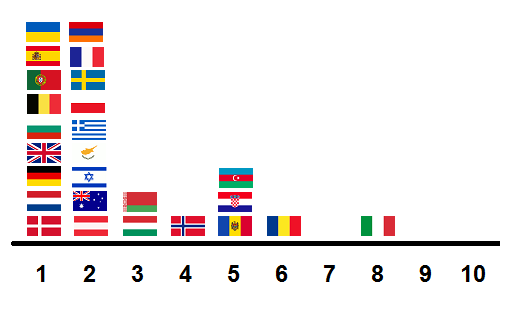 A few weeks ago, I posted a “Eurovision Camp Factor” scale, setting up scores from 1 (a basic, straightforward performance) to 10 (way over the top in everything). How did the 2017 Eurovision Song Contest turn out? Not a lot of camp there. Francesco Gabbani’s “Occidentali’s Karma” got Italy the most Camp. A dancing gorilla, and a lot of rainbow graphics will do that. Romania’s Ilinca and and Alex Florea performed “Yodel It!” with giant toy cannons on stage, and toy soldiers in the background graphics. I was honestly expecting the cannons to shoot confetti at the end. That’s good enough for a Camp Score of 6. Everyone else was rather normal – or at least as “normal” as one can get in Eurovision. As far as the average Camp Factor goes, there are three ways statisticians can get an average: mean, median, and mode. “Mean” is what is typically used as an “average”. Total all the points, and divide by the number of acts. By my scoring, this year’s mean was 2.2 – rather low, wouldn’t you agree? The “median” is the value that’s right in the middle when you list every data point from low to high. There are the same number of scores below it as there are above it. I get a median of 2. The “mode” is the value that has the most data points. Here, it’s a tie between 1 and 2, with nine songs each. Could I say the mode is 1.5? Whichever “average” you use, it’s very low. My scoring system is very subjective, so you may disagree with it. If you look over the performances in this year’s Grand Final thanks to one of the many recaps (official and unofficial), you can score them yourself! If you do, let me know what you come up with!